9Ask a mechanical, structural, or electrical engineer how far they would get without a heavy reliance on a firm mathematical foundation, and they will tell you, not far. Yet so-called software engineers often practice their art with little or no idea of the mathematical underpinnings of what they are doing. And then we wonder why software is notorious for being delivered late and full of bugs, while other engineers routinely deliver finished bridges, automobiles, electrical appliances, etc., on time and with only minor defects. This book sets out to redress this imbalance. Members of my advanced development team at Adobe who took the course based on the same material all benefited greatly from the time invested. It may appear as a highly technical text intended only for computer scientists, but it should be required reading for all practicing software engineers. The book contains some of the most beautiful code I have ever seen. I am happy to see the content of Alex s course, the development and teaching of which I strongly supported as the CTO of Silicon Graphics, now available to all programmers in this elegant little book. 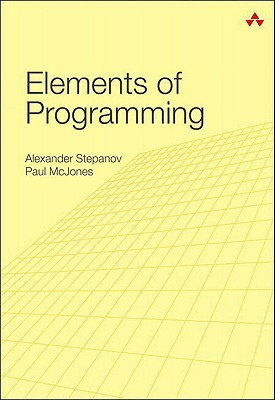 Elements of Programming provides a different understanding of programming than is presented elsewhere. Its major premise is that practical programming, like other areas of science and engineering, must be based on a solid mathematical foundation. The book shows that algorithms implemented in a real programming language, such as C++, can operate in the most general mathematical setting. For example, the fast exponentiation algorithm is defined to work with any associative operation. Using abstract algorithms leads to efficient, reliable, secure, and economical software. This is not an easy book. Nor is it a compilation of tips and tricks for incremental improvements in your programming skills. The book s value is more fundamental and, ultimately, more critical for insight into programming. To benefit fully, you will need to work through it from beginning to end, reading the code, proving the lemmas, and doing the exercises. When finished, you will see how the application of the deductive method to your programs assures that your system s software components will work together and behave as they must. The book presents a number of algorithms and requirements for types on which they are defined. The code for these descriptions also available on the Web is written in a small subset of C++ meant to be accessible to any experienced programmer. This subset is defined in a special language appendix coauthored by Sean Parent and Bjarne Stroustrup. Whether you are a software developer, or any other professional for whom programming is an important activity, or a committed student, you will come to understand what the book s experienced authors have been teaching and demonstrating for years that mathematics is good for programming, and that theory is good for practice.